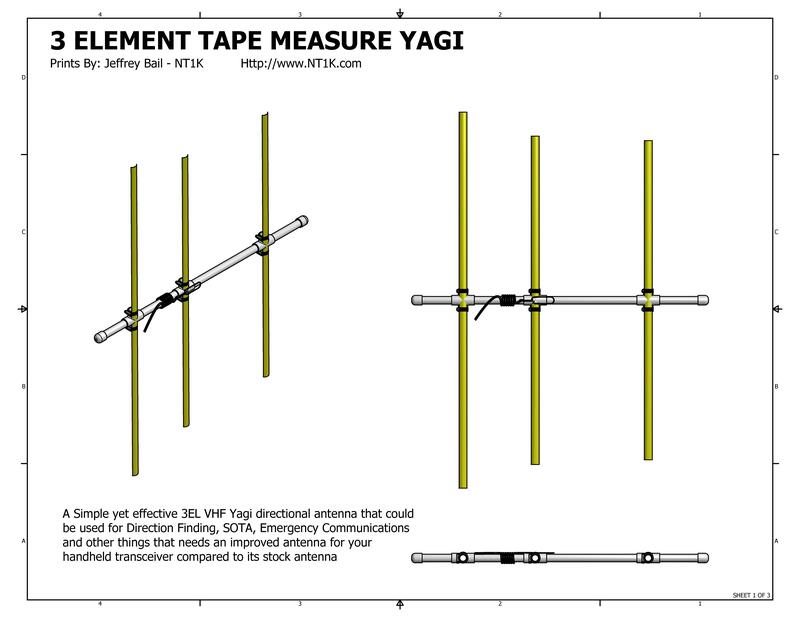 After seeing a lot of articles written about making a three element Yagi using PVC and a tape measure, I was interested but not excited about it. That was until I made a QSO with K1MAZ (Nick) while he was doing a SOTA Activation. I decided to try to make contact with Nick on VHF as it was spotted on the SOTA website. Nick was on top of Burley Hill in Union CT which is about 30mi from my QTH. He tried using his stock antenna on his Yaesu Handheld but it’s just a little too far out of range. I knew someone was trying to get in but there was no copy. A couple of minutes later I hear him again, but it sounded like he was in front of my house. He was S9+ and very clear audio. After meeting up with him I asked what antenna he used and he said that he was using his Tape Measure Yagi. I was somewhat amazed that it worked that well. 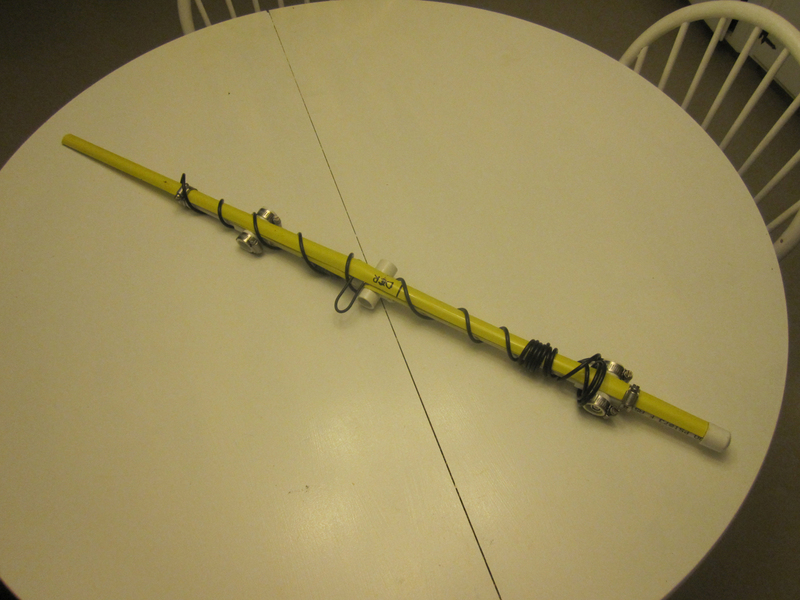 The first design I went with was from WB2HOL which appears to the origin of this particular antenna. 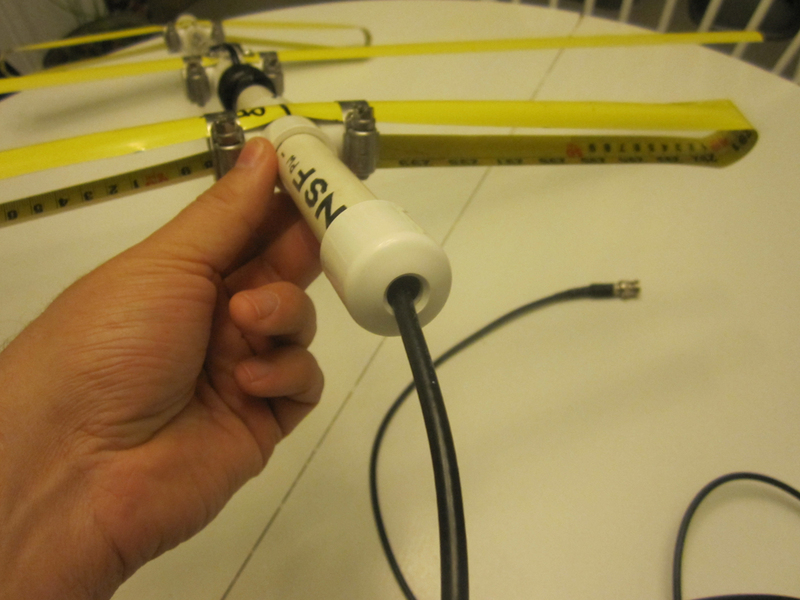 It’s designed to be a RDF (Radio Direction Finding) antenna. It could also be used in portable operations like SOTA or Field Day. I obtained all the dimensions needed from his website. I got the boom design from the Camden County Radio Society’s website which is slightly different from WB2HOL. 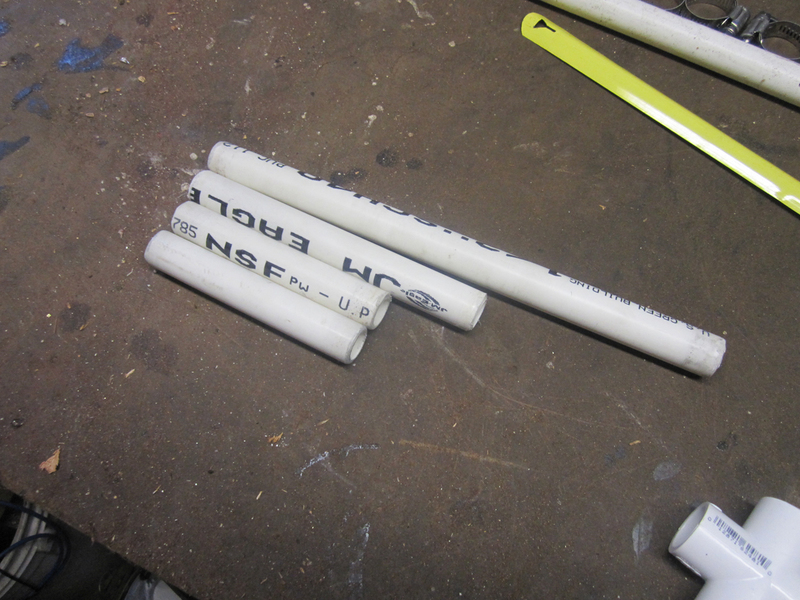 It replaced the tee used by the director with another cross tee and added a 5″ stub. I have no particular reason why I went with this book design. I just liked it and it avoids adding a different part even though it’s no big deal. Is the choke/balun needed? I’m not experienced enough to give you a yes or no answer. I decided to use it because it wasn’t going to cost me anything to do it. If it didn’t work our or was causing an issue then I can just simply un-wind it. I am not going to go into detail about making the beam as it’s already done for you in the those articles that I linked to above. However I will provide a detailed blueprint that is a little better than what I’ve seen out there. Please use all safety cautions while working with tools and parts! I tried as best as possible to get the exact dimensions of the PVC caps and cross tees but I found that the dimensions vary between manufacturers. 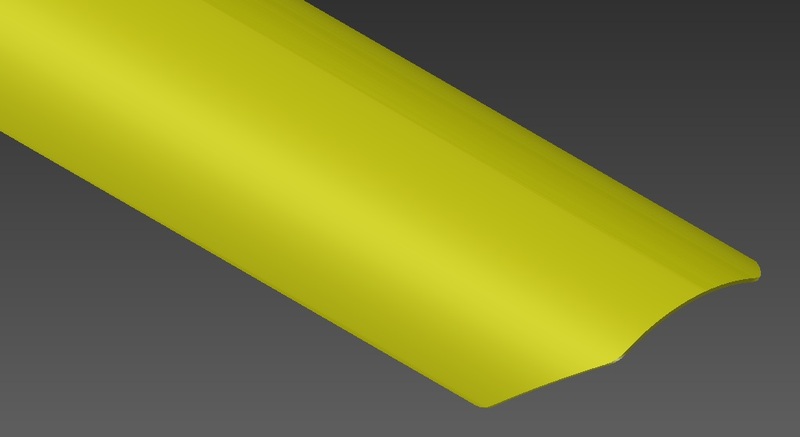 That will explain the 0.060″ (1.5mm) differnce in element spacing as noted on the print. 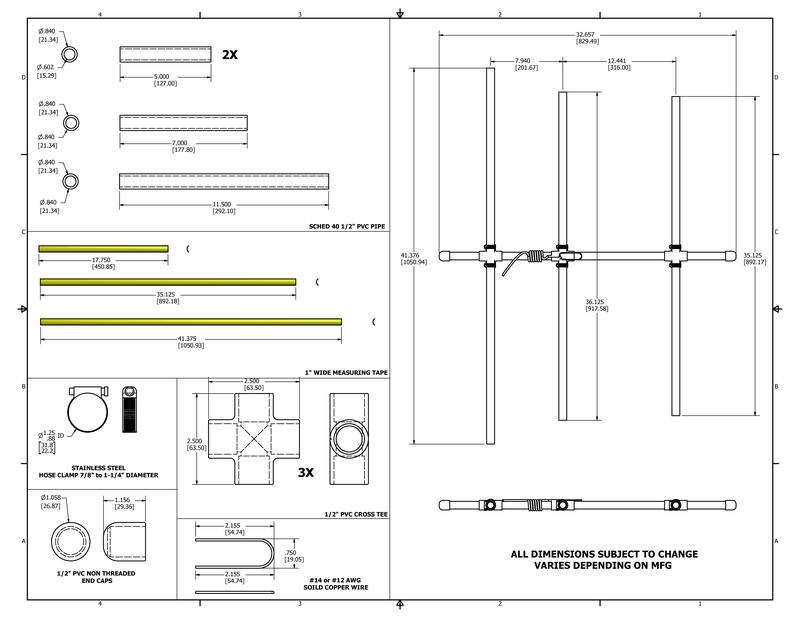 Along with the instructions on the blueprint, I would like to share some of my personal experiences when it comes to building and using the antenna. I didn’t have a PVC cutter as I rarely do PVC work. I also didn’t have a vice or clamp setup to use a regular saw or sawzall with. I ended up using a tubing cutter that is normally used on copper tubing for plumbing. It worked but it wasn’t pretty. It pushed the PVC to form a flange or lip around the entire diameter of the tube. I had to use a sander to remove the burr/lip. I also decided NOT to use PVC primer and cement. The parts fit together so tight that I didn’t even bother using it. The tape measure is somewhat sharp along the long edge. It’s not razor sharp but it’s sharp. Cutting the tape measure creates a real sharp edge. You can combat this by either wrapping the exposed edge with electrical tape or cutting a chamfer (corner) or both. I’m going to use a product call “Plasti-Dip) and coat the tips of each element with it. Hopefully you will be careful running around with the beam. Doing this will make things just a tad bit safer. I’d would either dismantle or cut out the bad sections of tape. If you already have a 1″ wide (or bigger) tape measure, I’d suggest buying a new one and cut apart your old one. I’ve notice coating usually wears out within the first couple of feet. My suggestion would be to start cutting the tape up from the oppisiet end. There is also an issue when it comes to soldering the tape measure. If you have normal flux core solder, you might have a hard time soldering the wires to the tape measure to where it won’t stick. I ended up using a liquid flux that is commonly used in the plumbing/welding industry. It’s an acidic flux that works great. After grinding away the paint/coating on the tape measure, I put just a teensy drop of flux on the exposed metal of the driven elements. After soldering the hairpin match and coax using a 100W iron, I took it over to the sink and washed off any left over residue that was still on the tape. I’ve been told and I’ve read that using this type of flux is pretty corrosive and will eat away at the metal it was applied to causing a bad connect. So please be careful. After a week of playing around with it, I have not noticed anything. Running the cable through the boom. You will notice that I drilled some holes extra holes. I want to run the coax through the center of the boom, have it come out to start the coil and back through. I did that so the cable couldn’t drag across or get snagged in the reflector and to provide a little more security with the coil. It’s not a big deal but I found it to be cleaner than having it zip-tied or taped to the boom. 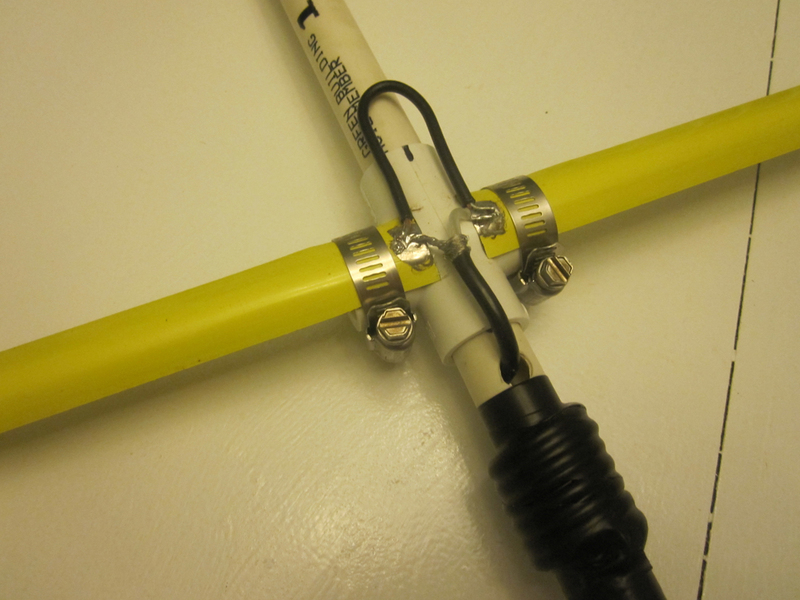 You can build this antenna for under $20. Since I work in trade where a lot of people accidentally cut off or destroy their tape measures, I have quite the collection of tape measures. If you already have a 1″ wide or bigger tape measure in your tool box, I’d suggest on purchasing a decent tape measure and use your old one for this project. When it comes to using used tape measures, I would make my cuts starting from the other end of the tape. Most used tapes have lots of wear and tear on the first 12″. Also don’t cheap out and get regular steel and electrical grade PVC conduit. 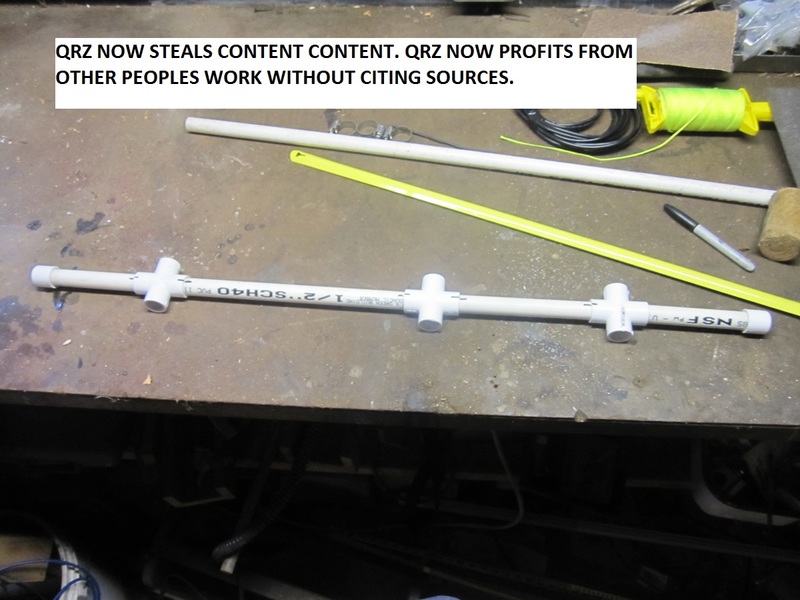 The clamps will rust and the electrical PVC has a thinner wall and will easily flex. It may not happen right away but time will take it’s toll. I know it’s a cheap antenna but it would be more cost effective in the long run. Nothing exciting but it was fun. Here is the complete setup. I gave myself enough slack on the coax incase I decided to mount the yagi on a tripod. 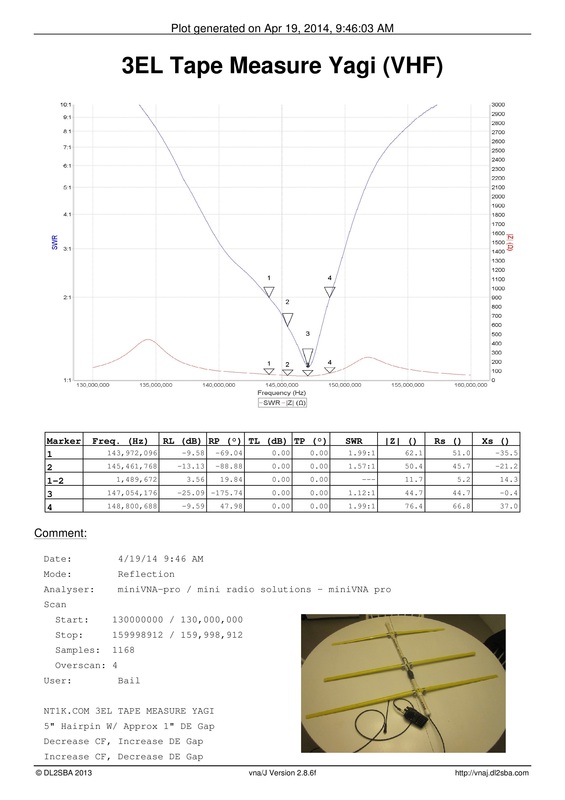 Here is a plot of the Yagi using the miniVNA Pro. Testing conditions involved hooking the calibrated analyzer to the end of the feed line and taking multiple readings while holding the antenna in my office. Increasing the gap lowers the center frequency. Overall it was a really fun build. It didn’t require any type of heavy equipment or tedious work. I have a feeling that running around the woods with a tape measure will end up with crimped or broken tape measure. However it would be much better that running around with 1/4″ (6.35mm) aluminum rod. Replacing the director and reflector would be easy as cutting the tape measure. So fart so good! Nicely done. Great explanation on how to do an easy build project with useful applications (EG Fox Hunt, SOTA Ringing up that distant repeater). Those detailed blueprints are a bonus! 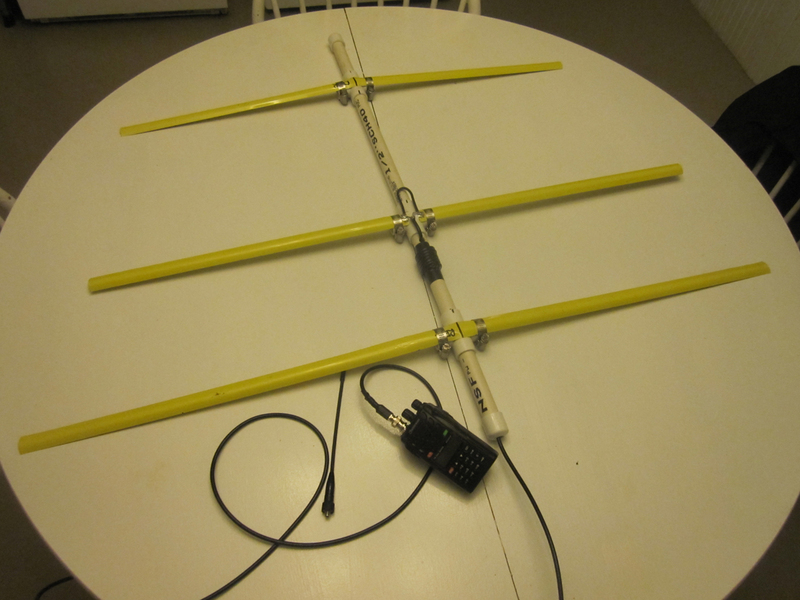 One has only to print them out, bring them to the hardware store, pick up the parts and it’s onward to assembling this useful & portable antenna. Excellent write up. Will try it for sure. Thanks gor sharing. Thank you for the blueprints. Works great. 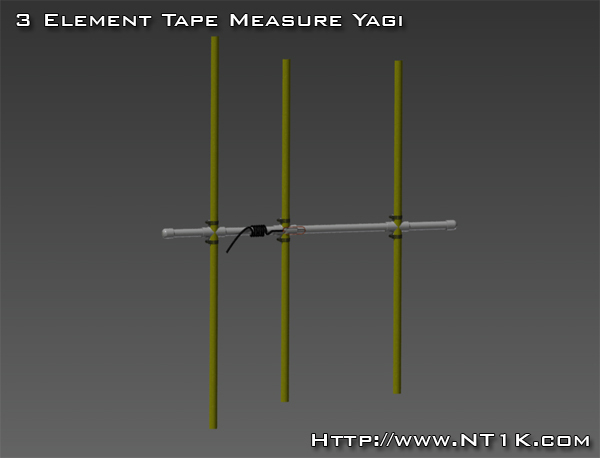 Thank you for your excellent write up on the vhf 3el tape measure yagi. 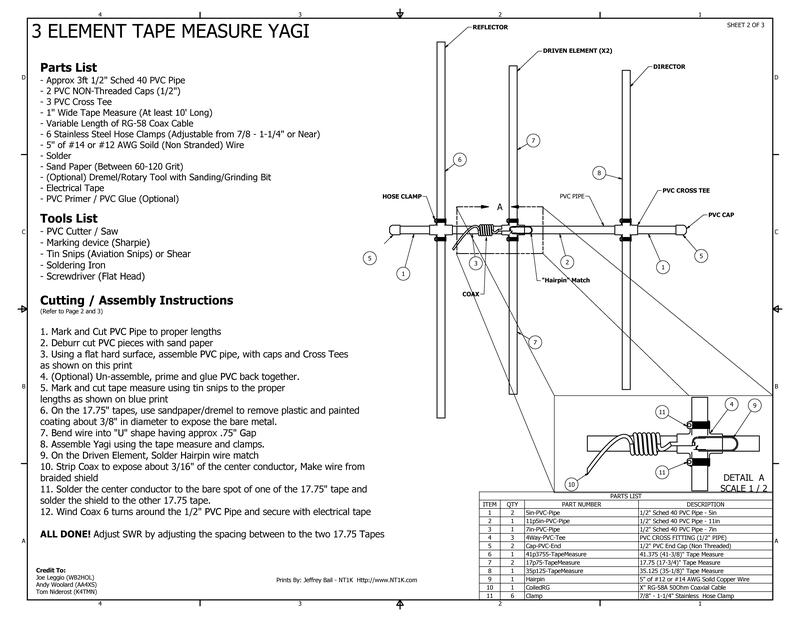 I’ve read about every article out there on tape measure yagi construction and yours is the best. Our club is interested in Fox Hunting and I’ve been looking for a good design to have our members build. Think we will use your article. You should submit your article to ARRL to have them publish it. It’s that good! Thanks again. 73, Doug Abrahamson, KC9SDO. Stumbled upon this design while searching for something else. I have already made a discone from tape measures and your page is so good that i think I will have a go at a Yagi. Excelent idea and expl. I build another one with 5 elements. Best rezults. I saw an antenna made like this, only he used velcro to secure the ends. I think that might solve the problem of sharp ends too. I am going to try to make this, I may be a lady but this doesn’t look any harder to make than my collapsible dipole antenna. Thank you for the PDF instructions!! I’m a little late to this party, but thanks for the great job on this article and the nice, detailed drawings in support. Going to build this today! Anyone have an idea of how many watts can be safely pushed through this antenna? Of course I have the few hand helds i’ll use it with but I am wondering if I can hook it up to a Kenwood Mobile rig at medium power (10w). 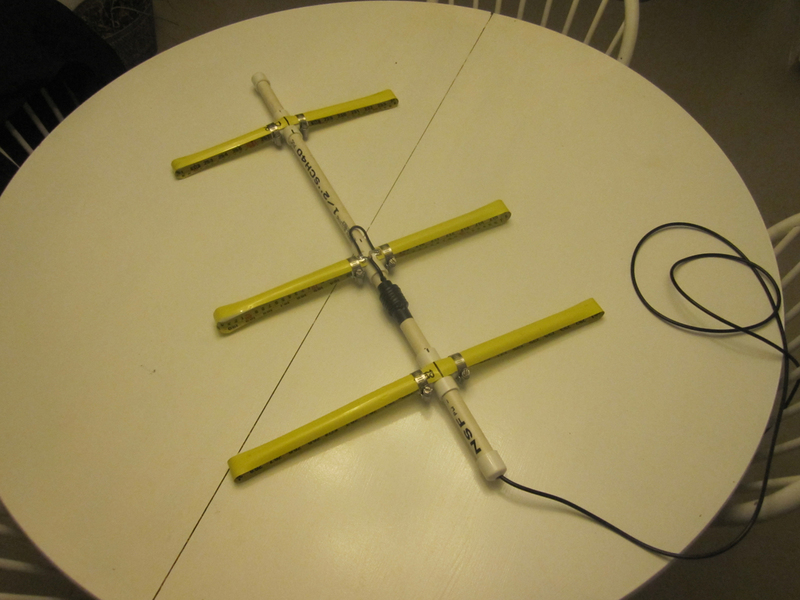 It has been successfully used at 400 watts for moonbounce (EME) contacts. 10 watts is not going to be an issue. I’m using 50 Watts with no problems. I read this post and I would like to duplicate your project. I tried to download the blueprint pdf but the link didn’t work for me. Would you please email me a copy?